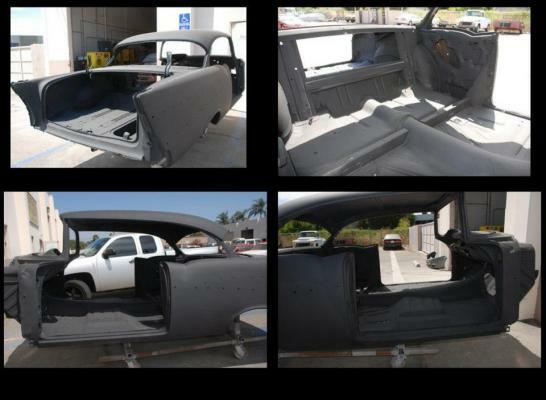 Bob's Bel-Air is making good progress! It sat in a garage for about 35 years hibernating. Now it is getting it's second life. We are doing a basic restoration more or less. A few upgrades like power disc brakes up front, a 700-r4 transmission behind the rebuilt original 283 engine. The 283 has been upgraded with a hydraulic roller cam for longevity, electronic ignition for reliability, and a 500 cfm 4-barrel carb for a little more performance. Other than that it is pretty much the way GM had it. Painted back to the original colors, all the stainless has been repolished and the chrome replated. New OE replacement interior will be going back in it. This will be a nice cruiser to take you back in time with a few added upgrades for safety and drivability.